In this article, we’ll be giving our opinions on the Best Bugaboo Strollers available. Bugaboo is an internationally renowned Dutch manufacturer of high-class pushchairs and luggage systems. It is trusted by over 1,000,000 million worldwide. 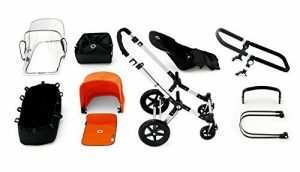 The Bugaboo’s range of luxury strollers is made up of premium models designed for various lifestyles. The names and characteristics are inspired by animals such as the donkey, buffalo, fox etc. Bugaboo Strollers are the preferred choice for parents who want nothing but the best for their kids. The build quality is simply stupendous andt their customer service too, is top notch. Let’s take a look at the best Bugaboo strollers in the US. This is a highly customizable set-up. It has loads of storage space and in just three simple clicks, the Donkey base can be expanded into a dual frame. 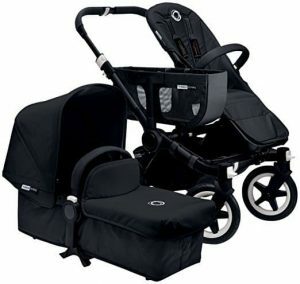 • Includes a chassis, frame, canopy wires, side luggage basket, rain cover, bassinet, underseat basket and seat fabric. • Perfect for twins, toddler and infant or for growing families. Parents can opt for the Donkey Duo extension kit if they plan to have another baby. • Bigger wheels are good over virtually any kind of terrain. The Buffalo is an elegant, well appointed stroller. The package includes black chassis, bassinet and seat fabric, canvas Sun canopy, apron plus a tote bag that can be hung safely from the vegan leather handlebar. • Usable from birth all the way up to 36 months or 37.5 pounds. No need to upgrade as the baby grows up. • Pricey. Other than that, this is more or less perfect. Note: This is a popular color and model and can be hard to find online. Grab it quickly if you like it. \Made to take on the city, this stroller is light yet durable. The special edition looks extra-nice and will definitely attract a lot of compliments! Package includes the frame, seat, seat pad, canopy, rain cover and under-seat basket. • Independent four wheel suspension for a super-smooth ride. • Cup holder needs to be purchased separately. (Under-seat basket is pretty big though). The Donkey can carry lots of luggage. It’s rugged, easy to use and can handle city streets as well as country roads with ease. This is the Twin version (double stroller) and it ferries around two kids (same age) in swashbuckling style and astounding comfort! This is an all terrain, heavy duty stroller. Bigger wheels ensure excellent maneuverability without compromising on stability and comfort. • A bit bulky.. Other than that, this is a top stroller. Lives up to the all-terrain tag. The Fox is a lightweight, compact luxury stroller. 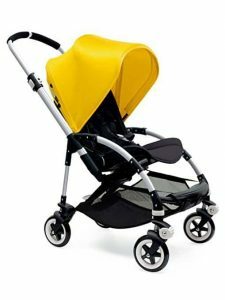 Just like all Bugaboo strollers, it is impeccably built and highly durable. It is usable right from birth all the way up to 48.5 pounds. Despite weighing just 22 pounds, the Fox is by no definition flimsy. In-fact, it iis an all-terrain vehicle that combines and smart styling and exceptional comfort into one highly attractive package. • It’s a little pricey! This could well be the best twin stroller out there. It is meant for twins or two babies of the same age. The Donkey is the definition of practicality. It boasts of oodles of luggage space and has a refined ride. • Each seat can hold up t 37.5 pounds. • Suitable for infants and toddlers. Recommended for children up to 36 months old. The Buffalo stroller showcases the best that Bugaboo has on offer. The stroller is hardy, sensible and durable while remaining refined, comfortable and stylish. I am running out of adjectives here…..that’s how good it is. • Popular model – can be hard to find online. Just as a Chameleon adapts to its surroundings; similarly, this Bugaboo stroller too is incredibly versatile and serves a variety of purposes. • Comes with both white AND orange! Perfect size. Not too big. Not too small. • Iconic design – reversible handlebars! This stroller is light and reliable just like a dutiful and hardworking bee! Can be used in the city and also on trips. Quick compact fold for easy storage. 5 striking colors to choose from. This mid-size stroller is available in 3 styles (Classic+, Fresh Collection and Special Edition) and 9 different colors. • Comfortable seat reclines to multiple positions. It’s also reversible. • Weight adjustable suspension – the ride quality is always plush! • Accessories such as cup holders are optional extras. As you may have noticed, Bugaboo strollers are priced a bit erm…dearly. However, do note that almost all strollers on this list have a perfect SNUGBABY and Amazon rating. They’re astonishingly good value for money. If budget is not a problem, just pick a Bugaboo – you cant beat Dutch precision and engineering!